Call me a curious little bean, but I love to see other people's makeup collections! 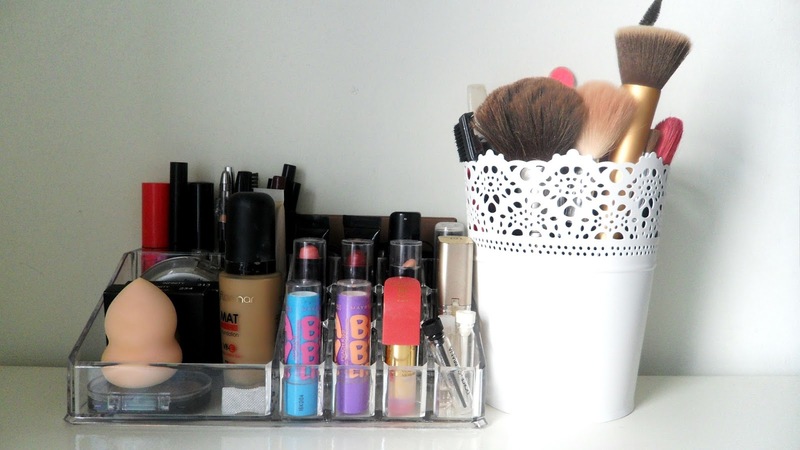 I'm always reading blogposts and watching Youtube videos about it, because I love to know what products people recommend, how they storage their makeup and also to get some inspiration for my own makeup collection. Today, I thought I'd do one of these posts. I bought this transparent container earlier this week on a place called 'Espaço Casa', which is decoration store. I went to IKEA over the weekend because my first idea was to buy one of those transparent drawers, but unfortunately,there wasn't any available, so I ended up buying this one for only 5,95€. 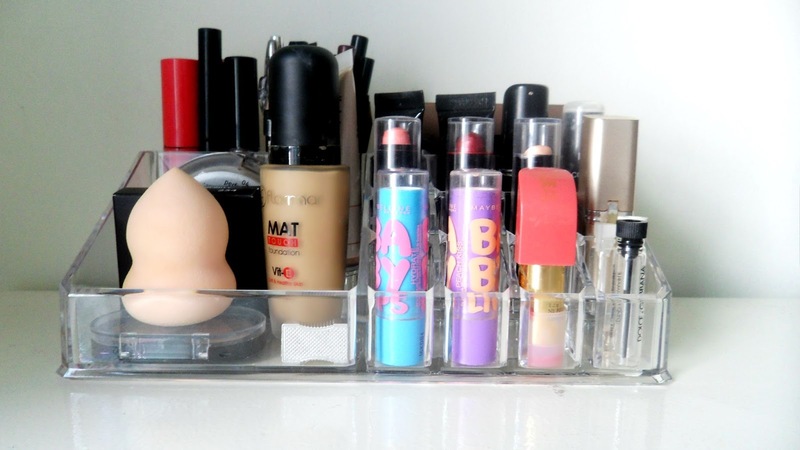 On this container, I keep my go-to makeup. I have my foundations, primers,concealers, highlighter and bronzer, some lipsticks (although I don't really wear lipstick), my Naked Basics pallet, lip pencils, eye pencils/eyeliners, my go-to mascara and my beauty blender. 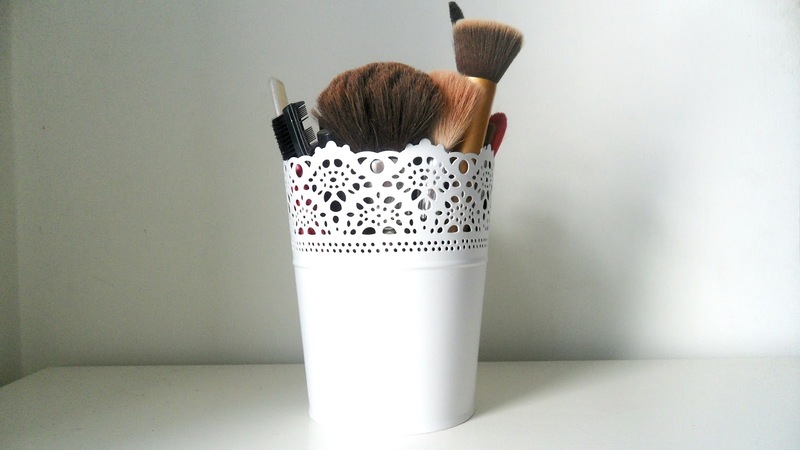 I went to IKEA over the weekend, as I mentioned above, and even though I didn't find what I was looking for, I found this really cute flower vase, which I'm now using as a makeup container. Here, I storage my makeup brushes, my eyelash curler, some nail files and also some mascaras I don't use often. My mom started laughing when I came home with this because she knew this was a flower vase, but I told her '' You'll see how cute it'll look'' and now look at that! Isn't it cute? And cheap! It only cost 2,50€! I have some makeup that didn't fit on the two containers I showed before, so I put them in this cute pink basket that my Godmother gave me. She actually gave me four of these, which I was using as makeup storage up until last week, but now I only use one of them and the other three are being used to storage washi tape, paper clips and other crafty stuff. On this basket, I have some single eyeshdows and some pallets, for example, my Makeup Forever lipstick pallet. What about you? How does your makeup collection look like?